No matter your health and fitness needs, there’s an app for that! Why not optimize the time you already spend on your smartphone and other devices and try a few of these excellent apps to help you boost your physical and mental health? Couch to 5K is one of the most popular running and fitness apps currently available, although it does cost a one-time fee of $2.99. This app is designed to help you reach your fitness goals and even train for a marathon. One of the nicest features about Couch to 5K is that it lets you create realistic goals that work within your busy schedule. Even if you only have 30 minutes per day, three days per week, Couch to 5K can help you get in shape. Heart disease is one of the leading causes of death nationwide for both men and women. Healthy Heart 2 is a free app that helps users stay on top of their heart health by tracking and monitoring high blood pressure, blood glucose, cholesterol levels, pulse, and other important factors. Having won the U.S. 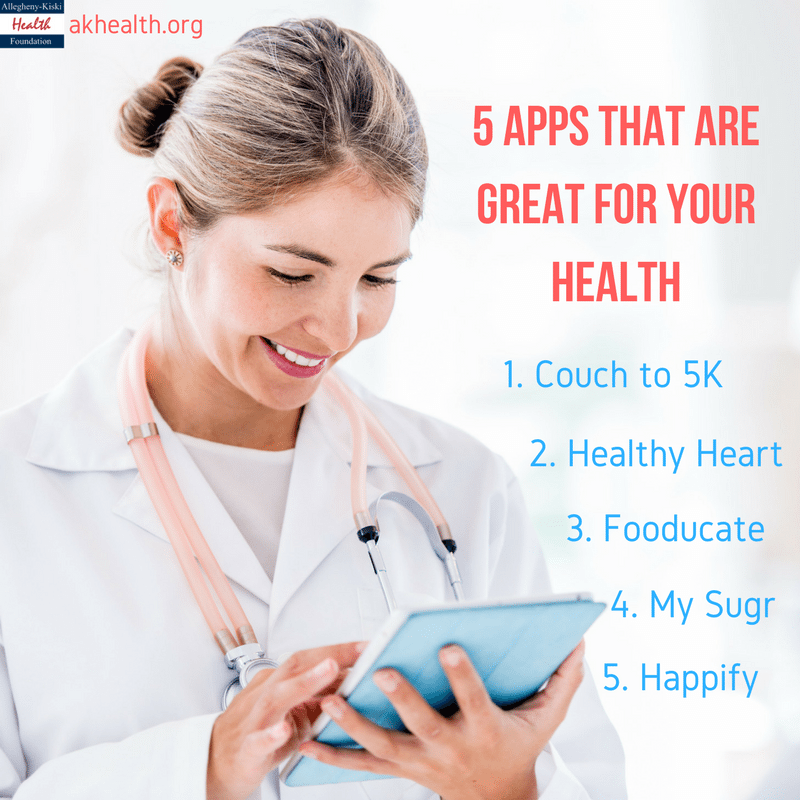 Surgeon General Health & Fitness App Challenge, Fooducate has quickly become one of the top health-related apps of 2017. Unlike many other food tracking apps out there, Fooducate helps you track the quality of the calories you consume, not just the quantity. You can also keep track of how much you exercise, and you can even sync your Apple watch to the app. My Sugr is a free app designed to help people with diabetes more easily and conveniently track blood sugars, carbs, bolus, and CGM. My Sugr also provides estimated HbA1c levels and motivating feedback to help you stay on track. For additional features, you can upgrade to the paid Pro version of the app. Maintaining good mental health is just as important as eating healthy and getting enough physical exercise. The Happify app equips you with customized tools to help you better cope with stress, anxiety, depression, and other negative thoughts and feelings that can get in the way of living a happy, healthy lifestyle. To get started, you simply answer a few questions about your general state of mind and mental health, and Happify will generate an individualized track to help you learn healthier habits and coping mechanisms and start getting the most out of life.